More documents in Drivers & Software Where is this place located? Click here to download the driver. Star Wars™: Battlefront Beta ‐ Performance and quality optimizations Fable Legends : Includes the latest DirectX® 12 optimizations for the Fable Legends: Benchmark. A black screen may be encountered on bootup on Windows 10 systems. The system will ultimately continue to the Windows login screen. 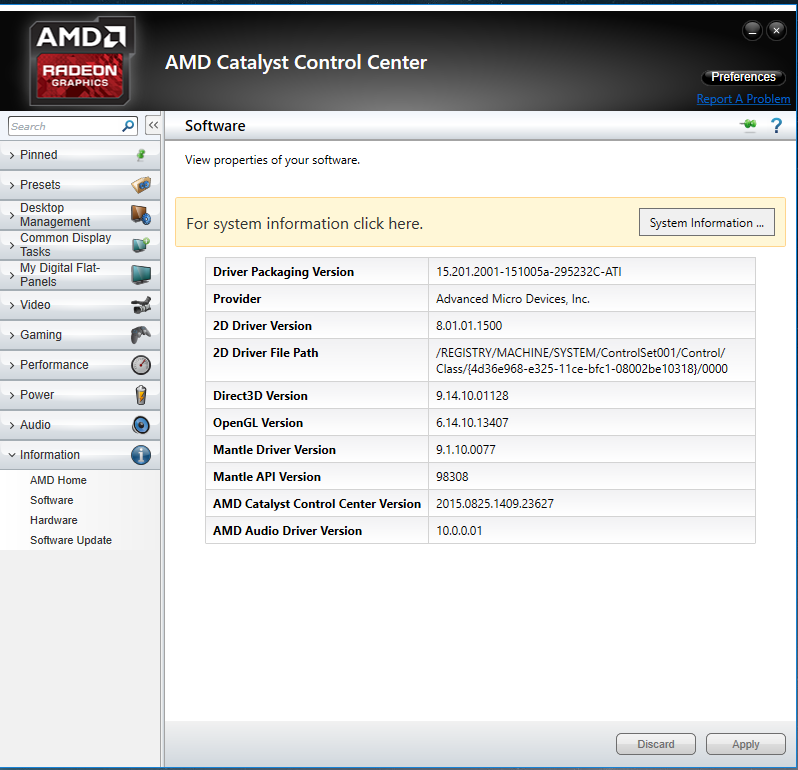 This driver release incorporates suggestions received through the AMD Issue Reporting Form. To provide us with your feedback, visit the AMD Issue Reporting Form. To install these Beta drivers "releases", does a Win 8.1 user need to deconfigure the driver signature verification? amdmatt do you have a time frame when these drivers will be sent to/coming from Windows Update for Windows 10 users? I don't, I'll need to check with my team about that and get back to you. No, these do not require you to disable driver signature verification. Thank you. All's well with the 15.9.1 installation here (Radeon HD 7850, 3 monitors). Just updated to 15.9, having issues with all flash videos (in any browser, but i use mainly firefox). It starts playing fine for maybe 10 seconds and then just freezes and browser screen goes black. When i switch to other tabs they go black too. Only restarting browser helps. Tried playing with hw acceleration settings but it didn't help. I never skipped an update and never had an issue. I have 260X GPU. I submitted a report but decided to write here just to make sure. Firefox version 41.0 is having issues. Rolling back to the previous version solved it for me. I am not saying that the drivers are not at fault, although mine works fine on all browsers, but maybe it's the glitchy Firefox. I think it's due to a memory leak. Are you using W10? Had same issue...resolved by rolling back to earlier driver version. Submitted report. WHY 15.8 UNAVAILABLE? Anyone have a link that doesn't automatically link to 15.9? Got some strange driver crash on Windows 10 64 bit with 15.9 Beta driver on my R9 290 GPU. Check the driver pls, i think is some problem with this one. I found the problem, my video memory go up to full 4096 MB and my card crash with this 15.9 Beta driver if watching a youtube video in Firefox for example, this is very bad, i hope you fix it, going back to 15.7.1 i got no problem. So this is a driver problem not Firefox. Currently downloading 15.9 beta. I hope this fixes driver crashing issues on A8-7600 + R7 240 on dual graphics (Win10 Pro 64bit) when running anything with OpenGL. Will post it here again and use the AMD issue reporting form again if it still isn't fixed (problem started and already reported 2 months ago). Edit: Done with downloading and installation. Once I rebooted my PC I knew there was a problem. I waited for more than 10 minutes but it was stuck on a black screen and a loading cursor. I restarted it again and I am unable to reach the log in screen. I restarted and disabled the APU, I logged in and saw that AMD Gaming Evolved video recording with Plays.tv got disabled. Using only the R7 240 graphics card, I was able to run most of my other games excluding Dota2. As expected there is a drop in performance compared to when it was running dual graphics. Metro Redux is no longer stable 60FPS and Bioshock Infinite got locked to 30FPS. Only thing that had better performance was Hyperdimension Neptunia Re;birth 2 (OpenGL). I tried running it on dual graphics again but it just doesn't work and gets stuck while loading a game (Computer won't even boot if it is enabled). My computer finally froze when I tried running Euro Truck Simulator 2. I will roll back my drivers AGAIN back to Omega 14.12. I will report the issue through AMD issue reporting form later. I wonder how many months I will count before they finally fix these issues. Update: The freaking roll back failed. The driver for APU was still version 15 and afterwards CCC is no longer installed. What the hell happened here? I had rolled back and forth from these failures series of 5 CCC installer and this is the worse thing I have experienced. Rolling back was really simple when I did it earlier but now, windows update comes in and make things worse. We are aware that some users are experiencing an issue in AMD Catalyst 15.9 Beta that causes all available video memory to be used whilst resizing active browser windows. Thank you for bringing this issue to our attention and being patient whilst we continue to investigate. We're working on getting it resolved as soon as possible. For users looking for an alternative driver that does not experience this issue please find Catalyst 15.7.1 located here. Very good, is good to see that someone fixing this. But i think someone was rushed with this driver and not testing all the bug`s. A month is "...rushed..." to you?? You took that line from that movie, right? The guy responds: "Funny like a clown? ", right? i was wondering... is now supported the vce feature with this new version of the driver?? Hi, I've tried all these drivers and they all do not work well with dual graphics enabled for A8-7600 + R7 240 (Still using Omega 14.12). Graphics driver stops responding when running anything that utilizes OpenGL. Can you please tell me if I would still be having problems with this new update? AMD has wasted a lot of my time trying to find which of these drivers would work on my system. Issue resolved with FURY X and online videos with this updated driver. Thanks. Does anyone know the criteria employed by AMD to decide which bugs are going to be fix in each new driver release? I have reported (and other users too) a general image corruption bug when Display Port connections are used to drive multiple high resolution monitors several time (when 15.7.1 was released, then again when 15.8 was released and again when 15.9 was released) and the bug still persists on 15.9.1. It is disappointing to see a bug that affects the most basic functionalities a graphics card should perform and that realy impairs productivity persisting for so long, while several game specific minor adjustments are part of every driver release. There is a thread on the support forums about the aforementioned bug in case someone wants to dig deeper on the issue (R9 290 multi monitor image corruption with Catalyst 15.7, 15.7.1, 15.8, 15.9, 15.10, 15.11). Unfortunately it seems all the bug reports I've sent to AMD and this thread have never got AMD's attention. I have a major issue.. Yesterday night, I downloaded 15.9.1 and installed them over 15.8. During a normal installation from previous updates, the screen goes black then returns momentaneously, which is normal, according to the Setup procedure. But, this time, the screen went black and never returned, for good. I couldn't interact through the rest of the Setup, and I was forced to shut down the system. To my dismay, after powering up again I didn't get the system BIOS logo to appear, still a black screen. After a while, I see the Windows 10 booting up logo, but after that screen, I'm back to a whole black screen. Windows 10 still seems responsive, I hear the welcome sound and the shut down sound. I tried to blindly enter system BIOS on next restart and I get in. When I move the mouse cursor in BIOS I can only see the green BIOS cursor leaving a trail of corruption behind the direction to which I move the mouse. It's the only visible thing I can see inside the system BIOS. I am inclined to say that updating from 15.8 to 15.9.1 has killed my vídeo card. I am in a dispair state at the moment. I purchased the card about 20 days ago, and it is so unfortunate that it is already dead. EDIT: For clarification, I don't connect multiple monitors at the same time, only one monitor, through DVI. At this home I have the HP monitor, and at the other home I have the Asus, never both together. Appreciate your attention on this matter. Thank you. Had the same issue couple of years back...if the BIOS doesn't post...could be your motherboard. Had to replace mine with the Formula Z.
Hello. I tried that as my last effort, but still no good news. Here's what I tried. First I ran Windows in safe mode. In this mode, the card was apparently working, though I was still getting corruption inside the BIOS, a whole black screen with the cursor trailing corruption. Symptons that the card died in my opinion. I tried to use Windows system restore, but after about 30 minutes of waiting, Windows tells me it cannot restore to that point. Switched the R9 390 to the HD 5450, used the same DVI cable and it surprised me that I couldn't see anything at all being displayed on the monitor. Thanksfully this card has a VGA output as well as the monitor, and I used that instead. I boot the system, I get image, no corruption, no issues this way, with the VGA cable. Upon booting to Windows, I see that the drivers installed were the 15.8 and not the 15.9.1. As I mentioned in the other post, I couldn't follow through the rest of the Setup once the screen went black. First, I used Catalyst uninstaller, but it failed to uninstall. It didn't guide me through any uninstallation procedure. It simply disappeared from the list of programs to uninstall. I manually told Windows to restart and Catalyst was still running on startup and no way to run the uninstaller. I resorted to using DDU uninstaller, and it cleared everything. I ordered it to uninstall drivers and shut down the system in safe mode. I posteriorly switched from the HD 5450 to the R9 390, now back to the DVI cable. Turning on the system, I get the same no BIOS logo symptom, I see Windows booting in normal mode, and I was getting image inside Windows, with the very basic drivers. I can interact. Everything seemed going well, and I was getting my hopes back again. I then installed Catalyst 15.8, knowing that these were the drivers which the card was working. During Setup it did not blink black and back this time, it just installed all of it, successfully, and asked for a Windows restart, which I did. So it restarts, no BIOS logo once again, I see Windows booting, and then, after the logo, it is back to a whole black screen. All my hopes were down the drain once again. It's dead. I'm sending it back to warranty tomorrow and hope they tell me what happened to it. Seems this issue is still appearing.